In our last blog about the Let's Paint program, we gave you an inside look at what you can expect when you tune in to Donna Dewberry's video lessons as she paints a flower of every month using her One Stroke method. As promised, we do have more in store! Recently, we launched Let's Paint Studio Lessons. Our painting expert, Andy Jones takes viewers through in-depth studio lessons to expand or (if you're a first-timer) develop you into a more skilled painter. 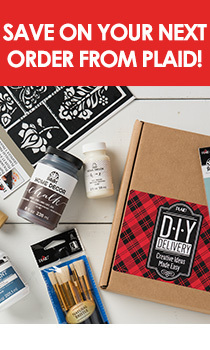 To perfectly complement the Studio Lessons on YouTube, The FolkArt Studio Lessons Kit includes FolkArt Acrylic Paint, FolkArt Blending Gel, a collection of brushes, plus teaching guides and more! We didn't stop there - our Let's Paint program is an immersive digital experience where people of all ages and skill levels can cultivate their creativity at their pace and to their comfort. Our weekly Skill Builders are short tutorial clips where Andy breaks down a wide array of need-to-know skills for the painter to master their Studio Lessons. Andy will also answer your questions via livestream to tackle any burning questions or advice you may need on how to master your latest paint project. Got questions? Submit them in our comments below! In the meantime, get started with the very first Studio Lesson below and be sure to share your paint projects with us using #LetsPaint #PlaidCrafts.